First published in 1996, this encyclopedia is a comprehensive reference resource that pulls together a vast amount of material on a rich historical era, presenting it in a balanced way that offers hard-to-find facts and detailed information. 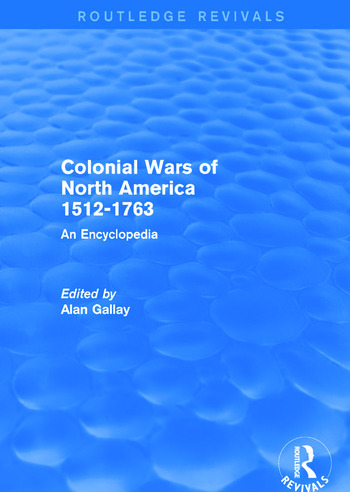 The volume was the first encyclopedic account of the United States' colonial military experience. It features 650 essays by more than 130 historians, archaeologists, anthropologists, geographers, and other scholarly experts on a variety of topics that cover all of colonial America's diverse peoples. In addition to wars, battles, and treaties, analytical essays explore the diplomatic and military history of over 50 Native American groups, as well as Dutch, English, French, Spanish, and Swiss colonies. It's the first source to consult for the political activities of an Indian nation, the details about the disposition of forces in a battle, or the significance of a fort to its size, location, and strength. In addition to its reference capabilities, the book's detailed material has been, and will continue to be highly useful to students as a supplementary text and as a handy source for reporters and papers.